When I’m reading creationist textbooks, one thing I’m grateful for is that they’re not written by flat-earthers. One wonders why they’re not: after all, a literal reading of the Bible points very much to the idea that the earth is, indeed, a plane rather than a sphere. But some ideas are so difficult to sustain in the face of plain scientific evidence that even people who, in all seriousness, claim that every living thing on Earth descends from the inmates of a single wooden boat which survived a violent global flood, can’t bring themselves to believe it. Really, did anyone post-Renaissance ever seriously believe that nonsense? 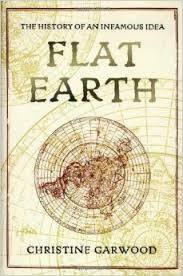 According to Christine Garwood’s remarkable book Flat Earth: The History of an Infamous Idea: yep. They surely did. Oh, not the majority of the early Christian church leaders, mind – they were fine with the whole globe thing. Garwood does, however, introduce us to the outliers who wanted their Earth served up like a plate. She gently debunks the notion that everyone in Columbus’s day was convinced he was a madman who was going to go sailing right over the literal edge. No, they had other odd (and often entertaining to us modern folk) ideas. It’s nice to see the old tall tales cut down to size. Really, it doesn’t become us to view most of our predecessors as ignorant fools. But if it’s ignorant fools you’re after, don’t despair: you’ll meet a few. You’ll also get to go inside an American city founded (in part) on flat earth belief. And no, that wasn’t some mid-nineteenth century silliness. It happened in the early 20th century. Garwood shows the arguments over the earth’s rotundity that irritated Charles Lyell, and got Alfred Russel Wallace sucked into a quagmire of a bet in the hopes that winning it “may stop these foolish people.” Flat-earthers, it turns out, were just as impervious to evidence as our modern creationists. History repeats. That’s one reason this book makes such valuable reading. We also meet a doggedly-determined old man who ran a flat earth society from his sickbed, and get some insight into the motivations for such beliefs. While giving no quarter to their incorrect ideas, Garwood does paint these Don Quixotes with a deft and sympathetic brush. We feel for them, even as we shake our heads over their sadly-mistaken beliefs. We also get to meet a zany bunch of tricksters who used a claim of flat-earth belief to keep scientists on their toes. This is a thoroughly enjoyable read, and a valuable one, reminding us that people are often smarter than we think, were less ignorant in ages past than we believe them to be – and that mistaken notions can crop up for stubborn reasons even in enlightened ages. My only gripe with it is that I wanted more! We can haz sequel, plz? Will you be looking at this more closely here? Oh, me too. sounds awesome. How heavily illustrated is it? I’m trying to cut down on the amount of physical stuff I acquire and have been doing my reading via Kindle on my phone. It’s not that great for illustrations. Flat Earth, my Aunt Fanny! Its a hollow globe and we live on the inside, everybody knows that. Early 20th cy.? Would that be Wilbur Glenn Voliva of Zion, IL? He was a fundie flat-earther. I first learned of him from Martin Gardner’s skeptical classic Fads and Fallacies in the Name of Science. It has some other related goodies, like the theory that the Earth is hollow. This includes Cyrus Reed Teed’s theory that the Earth is hollow and that we live on the inside of it. Don’t ask me how this “Koreshan Universology” is supposed to work. Dana, you may like Infinitesimal: How a Dangerous Mathematical Theory Shaped the Modern World. It tells how the Jesuits hated a mathematical idea so much that they basically put a stop to the Renaissance in Italy. Probably not too much, but we’ll see! Not very much at all, as I recall. And any illustrations aren’t essential to the text, so you can enjoy without. Yep, it’s Voliva! His story was fascinating in a passenger-train-wreck-with-gory-fatalities kind of way. I won’t be surprised if some of the kids raised in his schools went on to spawn nonsense of their own. Of course, some of ’em probably became outspoken iconoclasts! It’s on my wish list!